Turn your thermostat down in the winter or up in the summer just a few degrees and save both energy and money! Although it might feel really cozy to set your thermostat at 80°F when you're home in the winter, it might not be so fun when you get the bill! Most people find they can be very comfortable at a reasonable thermostat setting of around 68°F in the winter and 75-78°F in the summer. And these setting save money. In fact, nearly half of your home energy expenses go towards heating and cooling your home. Adjusting your thermostat just a few degrees can save you 5­-10% a year on heating or cooling and also reduces carbon emissions and air pollution. The goal—find a setting that is comfortable and can help save energy and money and make a positive impact! Most people find they can be very comfortable at a thermostat setting of around 68°F in the winter and 75-78°F in the summer. Some folks, for health reasons, need higher settings in the winter or lower in the summer. However, if you don’t have health requirements you might find you actually feel better at these new settings. Everyone is different—try it out and see what works for you. The goal is to find the most energy efficient setting that is comfortable for you. Take it slow. If you’re not ready for a big change all at once, try adjusting your thermostat one degree at a time. Try it for a week and see how it goes. If that works, try another degree until you reach the level that is most comfortable and energy efficient for you. Rock a sweater or some cool shorts. To be comfortable with your new thermostat settings, try a bit warmer clothes at home in the winter, or cooler clothes in the summer. Make this transition fun! Check through your wardrobe and find a few things to try. Or treat yourself and go get a new sweater for the occasion! Cozy slippers or thick socks and throw blankets are also great when you're at home during the winter. Likewise, on hot summer days, loose, lightweight clothing can help you to stay cool. Also drinking plenty of cool water or drinks helps as well. Pull out your great aunt’s famous homemade lemonade recipe and give it a try! Rearrange the furniture. Check to see if the places you often sit, like your couch or favorite chair, are close to a single-paned window or near a draft. If it is, consider moving it slightly to get out from the draft. Instead of pumping up the thermostat to warm a drafty corner, find a spot to sit in your house where the heating works well. Also, consider replacing that single-paned window, adding some energy efficient drapes, or sealing up that drafty door jamb to save more energy! Use a fan to help cool the room. In the summer heat, air motion of any kind creates a wind chill effect and makes the body feel cooler. 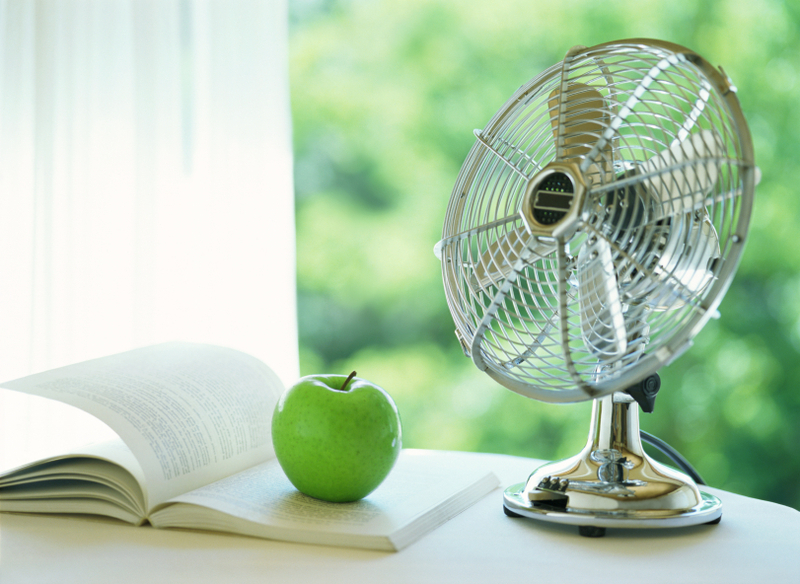 When you use a fan with your AC, you can actually set your thermostat 4°F higher and still stay comfortable. Set ceiling fans to move in a counterclockwise direction to draw warm air up. Remember that fans cool people, not rooms, so turn the fans off when you leave the room to avoid wasting energy. Learn more about keeping your house cool in the summer with Stay Cool action. Adjust temp before bedtime. At night, while you are sleeping, is a great time to turn your thermostat down a bit more. Consider adjusting the temperature to 55-60° in the winter and 80-85° in the summer. Make the change slowly and find a temperature that is comfortable for you. Add extra blankets to the bed in winter and try a bedside fan in the summer to make sleeping at your new thermostat setting more comfortable. If you find that you have trouble sleeping, back off the adjustment a bit until you sleep soundly. The bottom line—find the most energy efficient setting that is comfortable for you. Adjust temp before you leave. The easiest way to start saving money and energy is to make sure you aren’t heating or cooling an empty house! If everyone in your home goes to work or school during the day, you could save money by lowering the thermostat while everyone is away. You can save up to 10% of your heating costs by lowering your thermostat 10-15 degrees for 8 hours a day. If you have a programmable thermostat, program it to adjust for your daytime schedule. If you don’t have a programmable thermostat, try leaving a note by your car keys to remind you to adjust the thermostat before leaving each morning. Get Smart. Better yet, consider installing a Smart Thermostat. It can learn your schedule and change the temperature at night or when you’re away and cool or warm up your house before you wake up or get home. And you can easily adjust it from your phone. Check out the Install Smart Thermostat action to learn more.